You're like Flat Stanley, whaaaa? But yes, I have a FLAT approach to skincare that I want to share with you today that literally saves my life every time I travel. Maybe you're like me...maybe you're not, but I can't seem to avoid packing everything I own when preparing for a trip. I worry that I won't have what I need and as a frugalista, I don't want to buy what I already own while away from home. Does this sound familiar? Even if it doesn't (and if so, I'm jealous that you've mastered being a sane packer), I think this tip might come in handy. Also, it's worth the read considering I'm giving away some skincare swag. 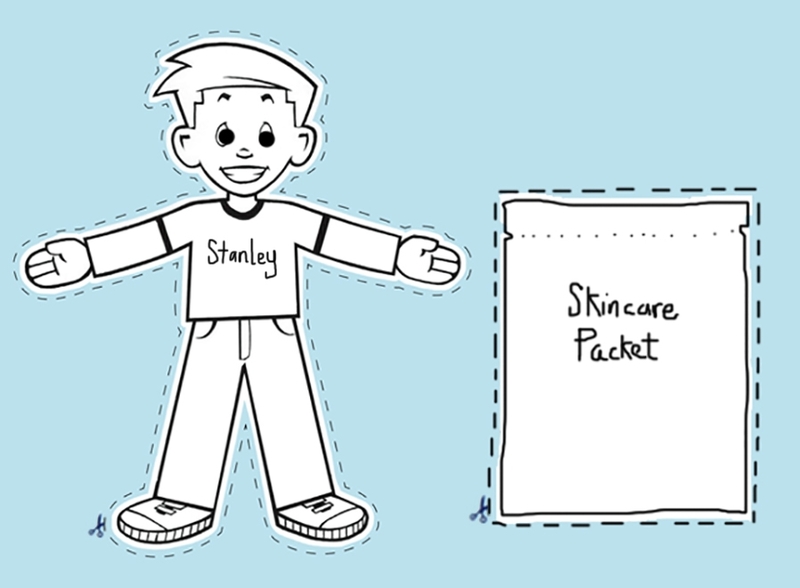 So here's my Flat Stanley Skincare Secret: I seek out skincare that's packaged flat and in single servings. I like the idea of using it then pitching it. The lighter my toiletries bag gets, the better! Fact of my life: my toiletry bag + makeup bag + hair dryer and roundbrushes = most of the weight in my suitcase. I know, I'm a sad, sad girl. But seriously, have you seen how much hair I have? I digress. The following facial skincare products are definitely ones you should check out because you can buy them in larger quantities to store at home for whenever you decide to whisk yourself away to paradise or somewhere a lot less fun on business. Let's start with Rescue Skin packets. I bought 2 boxes of these procollagen packets (the serum and the moisturizer) and it got me through all of my travels last year. For the science behind it, click here. Otherwise, I can tell you that I loved how it kept my face hydrated and the amount inside each packet couldn't have been more perfect and weightless. Want to try it? Enter my giveaway below! Next, Rejuvity from Isagenix. You can get a sample envelope of the entire Rejuvity skincare line (made for all skin types) like the one shown below. This envelope is paper thin and houses everything from a bamboo exfoliating polish to an age-defying eye cream. There's even a serum made with sea pearl ingredients that boosts elastin (it tingles a bit). Isagenix is a brand that prides itself on limiting toxins harmful to our bodies. They also make nutritional supplements. I'm usually not a fan of health and skincare companies that sell through home-based consultants BUT my friend from college sent me a bunch of Isagenix products that she swears by and Rejuvity stood out. Here's a little video on it. Want to try it? I'm giving 1 full Rejuvity envelope away! Just leave me a comment below this post telling me where you're traveling to next and why you need it. Otherwise, click here to get started on an order through my good friend, Kellen. And then there's Patchology! At first, I was a little freaked out by these Friday the 13th (aka Jason Vorhees) looking masks but then I got over it and used one. OMG! They're fantastic! I loved them so much after trying just one that I placed a huge order for my Style Up 2 Shape Up Quarterly Box #MIZ08. (There are still some #MIZ08 boxes left for the taking, btw.) Patchology makes several skincare treatments but this FlashMasque, as they call it, is unique because it's basically the quick facial you need when you're away from home. It's light, flat and will replenish your skin without a mess. Want to try it? Whoever wins my giveaway will be receiving 1 full box of Illuminate masks in addition to 2 Rescue Skin packets and the Rejuvity skincare envelope. I'm picking 1 winner for all the skincare swag mentioned above. Tell me where you're traveling to next and why you need it. Isn't that easy? Good luck!